Take a look at the unique, high-quality garden and home decorating gifts in our large showroom. Whenever possible, we select gifts that are "Made in USA". How about butterflies in iridescent colors to brighten the garden? Available in several sizes. Made in the US. Or perhaps your gardener would like to add one of the many water features on display at SmartyPlants? Water features add not only visual appeal, but a relaxing sound as well. These large pot fountains cascade all the way to the ground where the water falls into a hidden reservoir. There's nothing like a face to add character to a garden. Our selection includes giant masks up to 5' tall. Orchids are always a welcome gift. We have a large selection of unusual and healthy orchids for display indoors or out. These terrariums will brighten any decor. They're part of a selection of small gifts perfect for the holidays or as a thoughtful hostess gift. 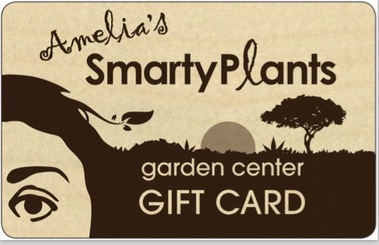 Here's a gift that would even work for the non-gardener. Succulents will survive even when other plants succumb to under watering or lack of light. Check out our huge selection of garden accessories, carefully chosen for their design--both functional and aesthetic. We have one of the area's largest selection of pots--pots of all sizes and materials. Perhaps your favorite gardener has a favorite tree that has outgrown its pot. Or maybe the pot doesn't do the specimen plant justice. Our pots range from small to massive. Every gardener has been disappointed by the quality of garden tools sold by the box stores. The blades rust and lose their edge in no time. Treat your gardener (or yourself) to a real tool--like these made in England of the finest steel. It's a true lifetime gift. See our large collection of hanging art that will dress up and bring character to a garden wall. Some are happy; some grumpy like this old guy. All are beautiful and of the highest quality. Is your favorite gardener also an animal lover? SmartyPlants features a large collection of wire from and moss topiary--including several breeds of dog. And of course there's ever imaginable plant, tree, and flower your gardener will love--like this beautiful bird of paradise. Would you like to give really high-quality garden ornaments? We have hundreds of lawn and garden features that any gardener would love to have. In addition to the large water features outside, we have smaller fountains, bird baths, and ornate planters in our indoor gallery. How about a gardening hat--a really classy one! How can anyone pass up a charming water feature like this? It's a gift that will last forever. Come and browse thousands of gifts--many unavailable anywhere else in the area--carefully selected for excellent design and quality.